Designed for comfort and ease of maintenance, these anti-fatigue mats are certified slip resistant by the National Floor Safety Institute. The “Laundry Friendly” Complete Comfort anti-fatigue mat from Mountville Mills features a Closed-Cell Nitrile Rubber construction. The anti-microbial treated, slip-resistant surface is grease, oil and chemical resistant. Complete Comfort mats are available with or without drainage holes, making them perfect for wet or dry areas. 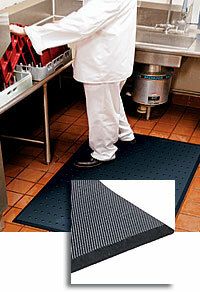 This ergonomically superior anti-fatigue mat is available in 5/8″ thickness in 3′ and 4′ widths up to 75′ in length. Perfect for retail or commercial applications and for work in wet or dry environments. The launderable and highly chemical-resistant Nitrile Rubber backing provides excellent cushion during use; giving maximum durability and longer surface life. All rubber surfaces give exceptional stain resistance and ease of maintenance. To clean, simply sweep or hose off as needed. A comfortable, functional dome design provides excellent relief from back and leg stress and rounded corners add the finishing touch to this high-performance anti-fatigue mat.